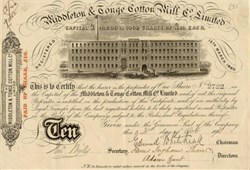 Beautifully engraved certificate from the Middleton & Tonge Cotton Mill Company, Ltd. issued in 1871. This historic document has an ornate border around it with a vignette of old factories, trains, horse driven wagon and a building with the sign "Dane Mills". This item is hand signed by the Company�s Chairman, Directors, and Secretary and is over 135 years old. There was great news on 21st July 1886, when the townships of Middleton and Tonge, along with Alkrington, and parts of Hopwood and Thornham, were incorporated into the borough of Middleton. The annoucement that Queen Victoria had awarded Middleton a charter was the signal for the Parish Church bells to be rung and flags to be hoisted.